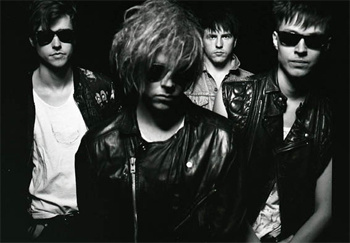 Quietus favourites Ulterior have been chosen to support Sisters of Mercy on the second leg of their European tour, we're pleased to report. The London-based industrial rock 'n' rollers will take over from I Like Trains (support for the first leg) on March 9th in Milan, before heading off for nine dates in total. Check them out on the Ulterior mySpace and while you're there, have a listen to new track 'Aporia' - epic synth goth greatness. Ulterior's chief machines man Benn McGregor told us that the band were chuffed to be asked to go on the jaunt with Andrew Eldritch and his merry men. "There are very few bands that all four of us truly admire," he said. "The Sisters Of Mercy are up there for us so this is a complete honour to share the stage with them. I think they are without doubt Karl's favorite band of all time, so he's very pleased indeed!! It's not every day this sort of thing lands in your inbox."